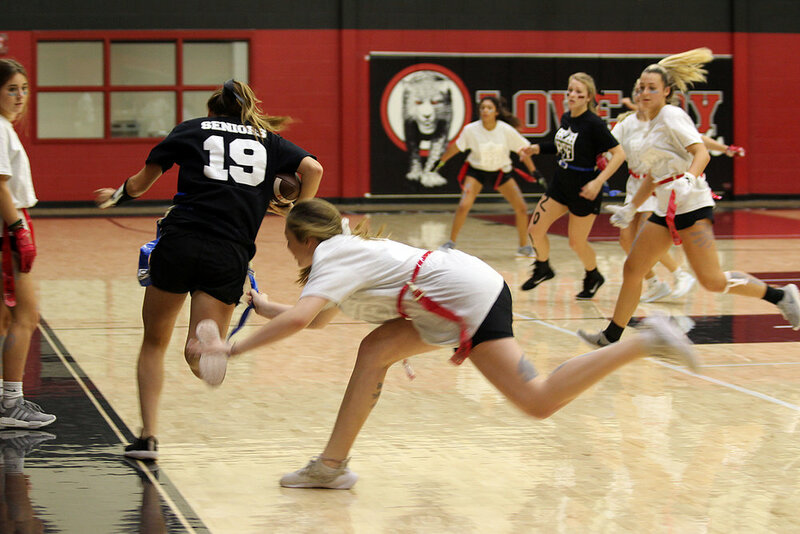 During the powder puff football games, held in the Lovejoy High School gym, classmates cheered on their grade level. Only seniors are allowed to sign up to be contestants for the Mr. Lovejoy contest. The contestants this year were Arvien Hassanzadeh, Bryce Braithwaite, Dylan Neitsch, Collin Jones, Walter Bedell, Daniel Keywork and Alec Welhouse. There were three categories in which the contestants were judged by a panel of teachers: Casual Wear, Talent and Formal Wear/Questions. Dylan Neitsch was crowned Mr. Lovejoy. Dollinger said, “He won over the crowd and judges with his whip skills.” During the talent portion of the contest, his courageous mother held flowers as targets for Neitsch to split apart with a whip.